Three weeks gone and our time together in San Sebastian is drawing to a close. With a handful of hours to our final sunset, we eat our last bocadillos and sip just one more cortado, hoping beyond all else that we took enough time to fall in love with the city we have come to know so well. With our last Spanish class finished, we claim our certificates and start on the goodbyes – of which there will always be too many – to our fellow classmates and companions. We rummage through pockets of loose change and bank notes, receipts and forgotten drink tickets, wondering if these crumbs from our adventures here will suffice as proof: that the city is real and we lived in it, not just some strange and wonderful place in our heads. It only seems fitting that we met for the final time here around the dinner table, where the Basque people live their lives. 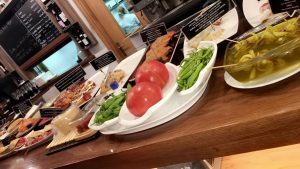 Having spent our siesta in a frenzy, revisiting the best of the best pintxo bars and savoring our favorites, some feared the impending supper. Yet, we arrived at La Txuketeria del Iraeta last night dressed in our best and hungry for more – not just for more of the exceptional cuisine we’ve become so accustomed to, but for more time to see that which has still evaded our eyes in the city. Huddled together in the back of the restaurant, we were treated to a meal perfectly indicative of the Basque culinary culture; with many dishes and few ingredients, the meal never appeals to a spectacle, but instead celebrates the quality of ingredients, the expertise behind their preparation, and the tradition of people coming together to eat. Over tomato salad in olive oil, roasted peppers, and txuleta – a massive and succulent cut of steak – we dined long and pushed the limits of our stomachs once more. The food, like much else in the city, reminds us to take note of the simple pleasures, to enjoy not that which demands to be enjoyed but that which needs not ask. Accompanying the meal was a good plenty of bottles of cider, with which we raised our glasses in celebration. First, to Julian, for sharing with us this beautiful city and his sense of wonder for it. Then, to our foreign friends with whom we’ve shared food, drink, language, and experience over these past three weeks. From them, we have learned an important lesson in the universality of our lives; to meet someone born thousands of miles away from you and to then, through knowing them, know yourself is a powerful perspective. Our toast to them was a toast to the things we share and the ways we differ, to the threads of love, loss, and indefinite futures that ran through every late night conversation. These are lessons and friends that we will now carry with us always. The final toast was, strange as it may seem, to ourselves. Whether meeting for the first time, reuniting, or even discovering fateful connections between us, our group came together to know one another, all so far from home. Now, as we leave the temporary home this city has become for us, it seems our mostly functional little family is seeing its end only just as it has begun. This toast is perhaps the hardest to make, for as we bid adieu to each other, so do we leave behind the selves that this city has known us by. The people we were for these three weeks will forever be trapped in an elsewhere – free from the threats of tragedy and temporality, stagnation and sublimation – they’ll remain here, in this Donostia August, this strange little world we’ve dreamt up together. Outside my window are the sounds of the construction, cars, and train station below. However, these are not the sounds by which I’ll remember San Sebastian. Instead, I’ll remember the laughter and lively conversation around the dinner table, the scraping of silverware and the clinking together of cider glasses in celebration. In the few hours we ate dinner together you can find the spirit of all our time here: the sharing of plates, of stories, of newfound sights and feelings. As I stuff clothes into luggage, stowing away bottles of txacoli for friends and family, I find myself wishing for a way to zip up the city and carry it through airport security, a way to share with those I love back home what I have shared with my new friends here. At least, could I bottle up the sunset? I suppose not. But I can enjoy it with these friends, one last time. The Basque Country is a very unique part of this world we are all a part of. 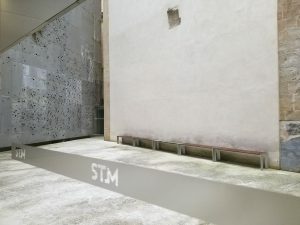 Perhaps the most unique quality of the Basques is their language. It is truly like no other with origins dating back to the Pre-Indo-European time. Unlike Latin-based languages, it is completely unique. Arriving in San Sebastián it was sort of shocking to hear people speak Spanish, that I am very familiar with, and then switch over to Basque, which is a completely different entity. 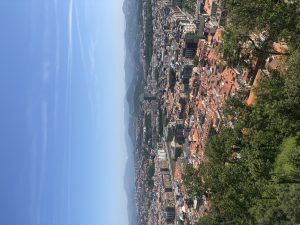 During our time here in San Sebastián my classmates and I were fortunate enough to have a Basque language class as to try and fit in with the locals a little more. We had a great instructor, Stuart, who was very enthusiastic and passionate about the language. We went over simple words used every day to at least try and communicate a little with the Basques. It was very interesting to see that almost every word had almost no similarity with its English translation. Language is the one completely unique aspect of a certain group of people like the Basques. Although ideas and views change throughout the years, one thing stays the same, language. In my opinion, language is the building block of culture. The best way to absorb the language and the culture is just through yourself into it. That is what the UMass Lowell Honors College did this summer. For three weeks we threw ourselves into the rich culture of the Basques. It is truly eye opening and something that must be done with an open mind. The Basque culture is truly so different than anything we have back home: children play in the streets, pets roam the streets without a leash, and everyone seems to be so connected even if they don’t know each other. Highly due to their distinct language, the Basques have a sense of pride and dignity in their humbling past. Being bilingual myself, I can definitely attest to this. Whenever I hear another person speaking Spanish, I am immediately interested in where they are from and it sparks a conversation. That is also how things seem to be here in the Basque Country, everyone is connected to their very unique language. Fortunately for me I have been bilingual since I was a baby. Growing up, my grandparents, who only spoke Spanish, babysat me and naturally I picked up the language. I think it is very important for people to be multilingual. It shows a high level of education and understanding and opens up many doors in life. Language helps resolve problems, from a simple argument with a person on the street to conflicts between nations. People tend to be a little more comfortable if they speak the same language. If there is a language barrier, it adds another level of discomfort and problem that usually does not help resolve a problem. It also opens doors professionally. Being multilingual usually gives people an extra edge when applying for jobs and sometimes even a little higher pay. It has also been proven that multilingual children have enhanced communication skills. By being exposed to different cultures through language they are able to understand different perspective making them more effective communicators. Studies have also shown that multilingual people show superior executive functioning, this means they are able to reason, plan, and problem solve at a higher rate than their monolingual counterparts. Multilingualism is something that everyone should take part in and explore once in their life. That is what San Sebastián did for my classmates and me. Many people are exposed to Spanish, one of the most common languages worldwide, but never have been introduced to Basque. We were all taken by surprise by the complexity of the language, well what may seem complex to us, and shocked to see almost no connection to Spanish. After all, we are in Spain. I think being in Spain and listening to two completely different languages from each other is a true testament to language connecting people to their roots regardless of change in the world. The Basque class, ultimately, was very humbling. Coming from the United States, the melting pot of the world, and have never heard Basque is truly eye opening of how big this world really is. However, the people always find a way to stay connected to their roots regardless of change, many times using their distinct languages. I left the language class with an interested spark in learning more about the language and hopefully one day be able to hold a conversation in Basque when I come back to visit the beautiful city of San Sebastián. Agur! 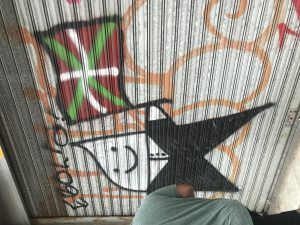 My favorite graffiti from the city, holding a Basque flag. Café con leche and avocado toast at Tabakalera. 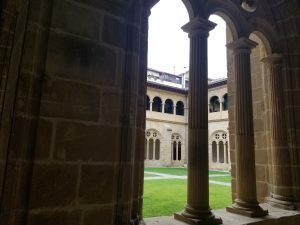 When I was first assigned to this blog date, I was doubtful that I would have much to say about the Basque government. As a 19 year old, I (unfortunately) barely know how my own country’s government works- let alone that of a country I had never even heard of until this December. However, I promised to myself that when my class and I sat down to talk to Ander Caballero, the former Basque Country Delegate to the United States, I would try my absolute best to gain an understanding of the governing body of the country that I have called home for the last 3 weeks. One of the first points that Ander brought up was how the Basque government is in a state of recovery from the Spanish recession. After unemployment rates hit extreme levels, sometimes getting as high as 27%, the Basques are beginning to aim towards creating a more profitable future for its citizens by building up services such as the rail and education systems. The Spanish recession has had a significant impact on the social community of Spain. The labor market has yet to recover and the effects on the economic cycle have been much more drastic than that in other European countries. However, the Basques belong to a unique area and have laws and ideals that are much different from that of the rest of continental Europe. For instance, the Basques hold a unique set of views when it comes to the rights of prisoners. In the Basque Country, many people believe that prisoners should serve their time close to their hometown. The intended purpose of this is meant to allow family and friends to visit and give prisoners the hope they need to serve their time and be a better person when they are released. Although, not everyone agrees that this will bring about the desired results. Ander explained that one of the counter arguments facing this topic are people who argue that by placing prisoners close to their old “stomping grounds”, they can easily get back in touch with the people who they committed their crimes with in the first place. On the topic of this particular issue, I can see both sides and am not quite sure where I would stand if I were a Basque citizen. I think that this is where a lot of conflict stems from, as the Basque Country is only recently re-emerging after the recession and trying to get its footing back. In the end, I think it is all a result of trial and error to see what works for this unique autonomous region. It is societal issues such as this one that the Basques face on the road to financial and social recovery. 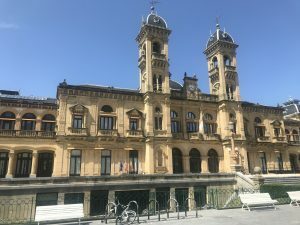 Another aspect of the Basque Country that I found to be drastically different from that of the United States is how the Basque workplace functions. At the Mondragon Cooperative in the Basque Country, the wage of the highest-paid worker within that company cannot exceed more than 7 times that of the lowest paid worker. I found this to be striking in comparison to the United States, where this rule is broken almost universally, and young people are fighting to earn more than minimum wage to sustain a lifestyle. This sentiment of balance and equality among workers continues into other aspects of Basque workplaces as well. When voting on conflicts, every worker in the Modragon Cooperative has an equal say in the process. This means that no one worker has more power in their vote than another, so even if the CEO and the youngest recruit are butting heads, both of their votes are considered equally. Again, I feel that there are both ups and downs to this ideology and would like to someday see it in action. As the Basque government attempts to move forward beyond its cloudy past, older generations are looking to the youth of the country to lead the way to success. As Kyle brought up during our discussion on the steps of the Tabakalera building, it can be difficult to be a young person who wants to make a noticeable change in society. Where do we start? How do we bring change in a positive way? Won’t the “big guys” always win? When posed this question, Ander replied in a way that made me think introspectively about my own willingness to make change when I see something going in a way that I don’t agree with. He said that we need to bring change about in a way that we are passionate about. This means not only that taking our interests a step further and using them for a larger benefit, but also not just following what everyone else is doing. Being just another cog in the machine isn’t what is going to make change. You have to go against the grain to even begin to work towards your goals. 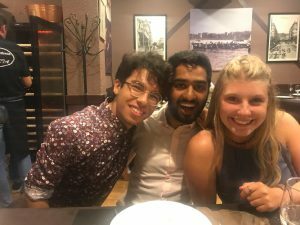 Being in Spain, experiencing new cultures, and talking to inspired locals such as Ander has made me think a lot about what I want to do with my life. I don’t want to do things just because “that’s the way it is”. This trip, to me, has been all about challenging my beliefs and pushing me into foreign territory (both literally and figuratively). I hope that, as Ander did, I can continue to do the same, find my passion, and use it to bring about a change that I am proud of. It was Sunday morning at 9:25 am, and everyone was still reeling from their Saturday night fun. A long, arduous day lay ahead. We were all professional complainers so one could say that our college maturity, minds, bodies, and souls, were absolutely decimated like the historical town of Guernica. Guernica was a flourishing town with it’s own stable government (local and regional) and a solid way of life. During the Spanish Civil War, however, Guernica (and the rest of the Basque Country) functioned under a constant sense of terror. Never knowing if one day a bomb would drop on their house. Never knowing if a Heinkel 52 would sweep by, taking everyone they loved. Never knowing that they would be largest victim of a little German “experiment.” Then came April 26th, 1937. Within minutes, everything that was built was turned into a field of rubble and fire. Simply put, Guernica was completely wiped off the map. 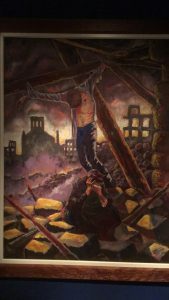 Pulling ourselves out of that image while in the Museum of Peace in Guernica was a hard task, but the museum’s greatest strength proved to be that it did not dwell on the past, but rather chose to remember it and move forwards towards reconciliation and peace. Guernica’s symbol is their tree of peace. Coincidentally, I actually sang a choir song titled, “The Tree of Peace,” but I doubt it was about Guernica. It’s heartwarming, though, to see symbols such as this come up in work around the world. It helps remind one that everyone in this world is connected, even if they don’t know it. The little things always speak the loudest. Honestly, the theme of this whole study abroad experience seems to appear that the world is a lot smaller and closer than anyone can imagine, yet, it is also vast, wonderous, and holds many surprises that even the most educated person cannot foretell. 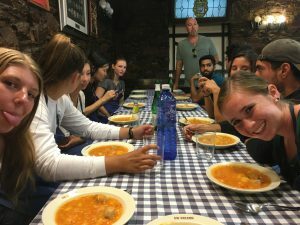 Our group of students had not really met up with one another before arriving in Spain, and while traveling together some of us learned that we literally have direct connections (family-wise) to one another that we never knew. This leads to another incredible power of traveling and immersing oneself in another culture. You explore the outside world, but somehow also explore and learn more about yourself, internally. When one reads the history and direction of Guernica, they start to realize their role in this world, and how similar situations occur around them everyday. When we were up in the mountains attending a fiesta, watching exhilirated dogs herd sheep, I looked out towards the coast and the beach, and took in tbe breathtaking view. In that moment I realized that the world is huge, and we are each one brush stroke on this enormous canvas, but without that stroke, the painting is incomplete. It’s humbling, slightly terrifying, mind-blowing, and satisfying to know that we all have a vital place in this world. After the fiesta (with the sheep herding), we ate the largest lunch ever. Period. From french fries, to salted pimientos of Gernika to the large tuna and abundance of chicken (which I didn’t eat, but I’ll take my classmates’ word for it that it was the best chicken ever), it was a feast to remember. In fact, I’m still full from it a day later. The best part, however, was everyone in our class sitting on the picnic bench, along with our professor and his family, laughing, eating, and chatting. It felt like a huge family. Happiness was radiating more intensely than the sun will ever radiate heat in its life. Definitely a snapshot memory that I’ll treasure. The icing on the cake, however, is our professor’s parents singing while we were getting on the bus. Everyone’s heart melted so fast, and, frankly, I am still touched by it. Personally, it reminds me of my family, as we are all very close with each other, not to mention my parents dance with and sing to each other all the time. Funny how much one can reap from eating lunch. 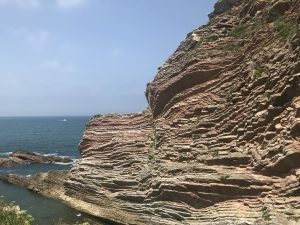 This blog post was supposed to be about the Spanish experience, but the largest takeaways and the strongest memories always seem to come from what may look like the mundane parts of the day. I could talk more about what happened to Guernica, the history of the sheep herding fiesta, and the peculiar setup of the town of Elantxobe (which I’ll get to), but you can read that in a textbook or on the internet. Of course I’m not completely discounting the rich history and cultural differences across the world, but how it changes a person and how it can open your mind is one of the true fruits of such travels. If anything, I hope you, the reader, can understand what I’m saying and perhaps check out the world yourself! A textbook will teach you facts on history, but being there will make you a part of history. Now back to the regularly scheduled programming. Elantxobe, a port town is set up on a mountain side, with rock/cobblestone boardwalks extended into the ocean. It’s a quiet town, or at least i thought it was, until our professor said that one of the most loudest, energetic fiestas is held here. Outside of that, though, children and families were swimming and jumping into the ocean, while couples sat with one’s head on the other’s shoulder, staring out into the horizon. There was definitely a charm to the town, whether it was how the buildings were setup going up the mountain, or just how people acted there. It was quiet and not screaming for tourist attention (which is a relief, personally). To get to the bus that took us back to Donostia, we had to hike the mountain to near the top. The view was gorgeous and absolutely stunning, though I doubt anyone was in a position to admire it. I believe I put a picture of it in this post. Another note however, pictures do not do justice to anything that we see when we travel. It’s all about being there and capturing it with the best camera of all time, you’re eyes and brain. Nothing beats that. That concludes Sunday’s long odyssey. I’m writing this blog post on Monday, and yesterday seems forever ago. No one can believe that we have only been here for two weeks, with less than seven days left to go. This brigs me to my final point. Time is short, enjoy it now, and don’t worry about it ending. Easier said than done, but today only comes once, take everything you can in that moment. When you look back later, you won’t regret the time you spent and the growth you made. Also remember: The little things speak the loudest in our small world. I hope my post had something to offer, enjoy! ¡Hasta luego! Here in San Sebastian, one of the most important cultural experiences one can have is that of food. We eat it every day, and yet here it is less of simply a meal and more part of a larger, social experience of the culture. The food is so deeply intertwined with the culture that it is impossible to separate from all other aspects of the city. Restaurants and bars are always packed with pintxos piled high on the counters and crowded with people, loud and bustling. Whether simply grabbing bocadillos for lunch, enjoying some pintxos in a bar, or sitting down for dinner with our host families, eating is a time where you try new things, share meals with friends and enjoy each other’s company. 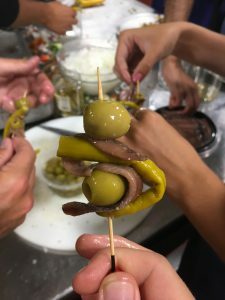 Especially here in San Sebastian, many of us are trying some different-looking foods for the first time, which can occasionally be scary or overwhelming but is almost always very rewarding. However, only eating the meals is leaving out a very important part of the culinary experience. Preparing food to eat together is a really big part of the culture and it is very different that what we are often used to in America. 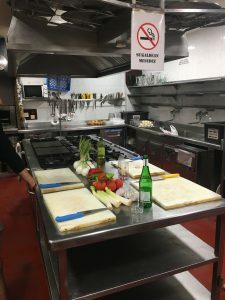 Last night we walked to Ur-Zaleak, a gastronomic society, which is a private cooking club where members can bring their own ingredients and go use the kitchen to cook for their family and friends, hang out, drink and eat together. 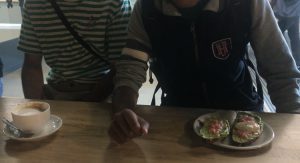 The cooking in these clubs is usually done by one or two members and they make enough food for the whole group to enjoy. It is tucked away underground on a hill, with a large kitchen and dining area. When we arrived we were right away given some cider to drink. It is typical of their cooking process to have a drink and be enjoying oneself while preparing the food. Once we all had poured ourselves a glass of cider, we were put to work chopping and dicing vegetables and peeling potatoes. All together we made five dishes. Three types of pintxos – Gilda (a skewer with peppers, olive and anchovy), tuna with mayonnaise spread on bread, and baked mushrooms with ham and cheese. 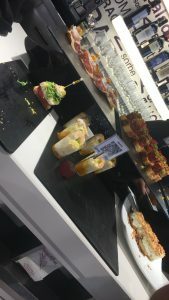 The pintxos we learned how to make are typical pintxos that we often have seen or eaten in bars, but learning the process behind them adds new flavor and meaning to eating them. The main dish, Marmitako, is a vegetable stew with tuna and potatoes. Finally for dessert we made torrijas, sliced bread soaked in cream, sugar and eggs, and then fried and served with caramelized sugar on top and ice cream. We learned how to cut potatoes by breaking them to release the starch, to add to the creaminess of the stew, and we were amazed by the making of mayonnaise by emulsification. We were seeing an entirely different side of the food we had been consuming on a regular basis. This Basque style of cooking is very different than what I was used to. Not a single measuring cup was used, our cooking teacher simply added ingredients as he saw fit. A couple eggs here, some vinegar there. “You never have to be afraid of cooking, just do it your way,” he said. This illustrates a very detailed picture of the food culture here – cooking is more about enjoying the process together with friends than about getting it exactly right. It also speaks to how no two dishes will ever turn out exactly the same, which adds to the excitement of trying new things. When cooking back at home, there is a more precise, methodical manner that everything must be done. Here, however, they cook a little, drink a little, smoke a little, chop some more ingredients, cook a bit more. There is no rush, no stress, no method to the relaxed disorder. It is as if the more the chefs are enjoying themselves cooking, the better the food will taste. And it is easy to believe this may well be true, considering how delicious each and every bite was. Throughout the evening, while we were cooking together, and afterwards as we enjoyed the food we had made, the conversation, chatter, and laughter never once died down. Being a part of the cooking process was not only a lot of fun, but it made enjoying the food together afterwards so much more meaningful. We had worked hard together to prepare these dishes and the experience of cooking together simply added to the flavor of the food itself. We learned that eating is only half of the culinary experience. This new knowledge that we learned is a just a small piece of the city and culture that we can bring home to share with our families and friends. The San Telmo Museum, a history museum depicting the cultural past of the Basque country, sits at the end of the old part of San Sebastian. As a constantly changing society, the Basque Country transforms with a common past and heritage as the basis. To create a better future, the museum visitors learn from the past to understand how the past society faced adversary and took advantage of opportunities. To eventually become a part of the mountain again, the architect and builders placed holes in the walls to let plant life grow over them. 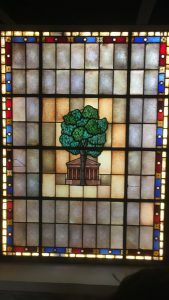 While only a temporary exhibit, the Greek myth exhibit begins the door to the past and displays pieces of art that depict past beliefs and religions. While the pieces themselves come from later time periods, the subjects in them tell the stories that the Greeks believed. 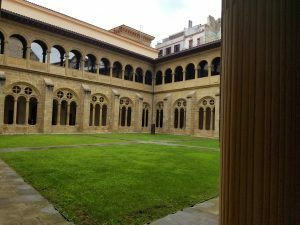 While a different society from the Basques, learning from the Greeks will also help visitors learn from the past. It darkens during film showings. What was once a monastery now acts as a museum for people to visit and learn about the history of the area. 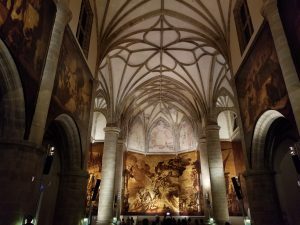 The area that appears to be a converted cathedral now houses paintings that depict the important roles that people took during the Spanish Civil War and a short film that gives an overview on Basque history. The film depicts both a history lesson and a message for the future. A courtyard, because why not? The rest of the museum goes chronologically from prehistoric times, leading up to the present day. Humans have been in the area now known as the Basque Country since prehistoric times. Like other societies, the ancestors of the Basque people eventually settled down and built settlements that once can still find today. Eventually, the Romans occupied the Basque area for materials and strategic location. Eventually, the people formed something akin to clans that one can see today in certain cities. These clans acted as protection against feudal lords. Whale hunting eventually became a major industry for the Basque country. The whales provided oil and other resources that made life easier. The iron industry also flourished. The surplus amounts of iron, charcoal, water- generated power, and easy access to ports allowed the people to flourish, along with the convenient and strategic location. The iron and need for whales allowed the ship- building industry to grow, as well. With more powerful ships comes an easier time for whale hunting, fishing and more food for the people. Such a development allowed for exploration of the sea. While some things, such as technological development and the different roles that people had, share similarities to other societies, the history shows the way that the ancestral Basques solved problems, which may or may not be different from other cultures. The personal interpretation would be that the similarities in social growth mean that different people have much in common than one may initially think. For example, the Basque Country had witch trials, similar to the American witch trials that had an impact on the current day trial system. The nomadic settlers who eventually turn to farming and ranching for food also occurs among other societies, as well. 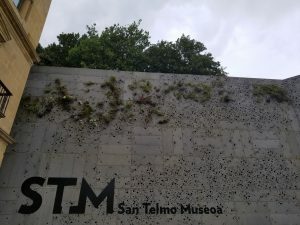 Museums, such as the San Telmo Museum, tell a story of the past that one can learn. To help society to progress, the people can learn about the past to figure out what works and what to avoid. While the development of Basque society shares similarities to the growths of other societies, one can see how things develop and went some things in the society exist today. The similarities between cultures show that they have more in common than differences. I began today just as I have begun every day here in San Sebastián, with a light breakfast consisting of fruit, toast, and coffee. For me, this is a refreshing change from the significantly heavier breakfasts of eggs, bacon, and pancakes that are common in the United States. After we ate, it was off to our daily Spanish class at Lacunza, where we hone our Spanish amongst peers from all around the world. In addition to myself and two other UMass Lowell students, my class consists of several students from a variety of countries such as France, Switzerland, Germany, and Australia. 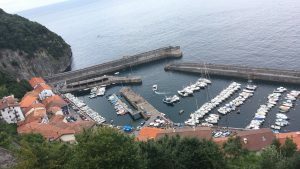 Going into this trip, I had only anticipated learning Spanish, and perhaps a few words of Basque, the local language unique to the Basque Country. 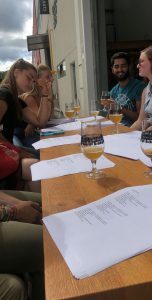 Much to the pleasure of our group, the friends we have made at Lacunza have taken it upon themselves to teach us a variety of phrases and common sayings in their own languages. Simply by its nature, Lacunza is a source of cultural interaction that enriches our studies, both of Spain and of the world as a whole. During our morning break, I was surprised to learn that our schedule for the week had been rearranged; while I had anticipated that my assigned activity would occur on Thursday, it had been moved up to today, which with a high squarely in the 90s turned out to be hottest day of our trip thus far. After we finished with Spanish class for the day, we found a restaurant where we sat and enjoyed our lunch of bocadillos despite the sweltering heat. Once finished, half of the group chose to go to the beach in an attempt to escape the heat, while the rest of us elected to explore some of the shops that San Sebastián has to offer. Walking the streets here is a very different experience than at home. The city as a whole is significantly more friendly to pedestrians and bikers than in the United States, and as a result there are fewer cars and the use of many streets is reserved for bikers and pedestrians. However, unlike in Boston where jaywalking is a misdemeanor most people don’t think about before committing, here in San Sebastián you ought to wait for the light to signal you to walk. My group was reminded of this first hand, as we were crossing the street but had to pause as the women ahead of us stopped to let some bikers pass, and a car came flying around the corner with no sign of slowing down as it approached. After a good laugh about our ‘near death experience’, we found a cafe in which we could spend our free time until the day’s excursion: a trip to the Combs of the Wind and to the top of Mount Igueldo via the funicular. 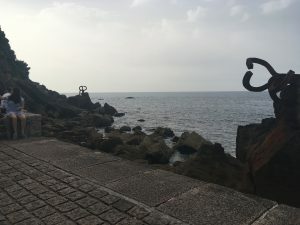 The Combs of the Wind is a series of sculptures by the Basque artist Eduardo Chillida. The Combs serve to welcome the wind as it enters the city, and consists of three twisted iron structures anchored in the rocks. The use of iron is designed to be an interaction of the art with nature, as the iron will oxidize with its exposure to the wind and the water over time. 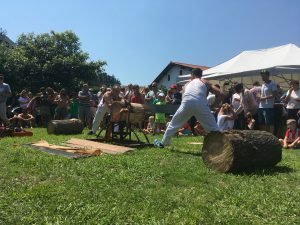 The interaction of humans with nature is evident throughout Basque culture. The city both surrounds and is surrounded by mountains, and the interplay between the two is a beauty all in itself. Whenever bare rock is exposed, such as when clearing land for a highway, the Spanish cover the exposed mountainside with fencing to catalyze the regrowth of greenery. The transition between the comparably hectic city and the luscious countryside is seamless. As beautiful as the representation of the interplay between man and nature is, the three sculptures also represent the past, the present, and the future. Closest to the city is the past, the most warped and twisted of the three. Next comes the present, where one must choose whether to focus solely on the past or to turn towards the more promising future, which takes the form of the most open sculpture of the three. The future lies closest to the ocean, and is the first to welcome new winds the city. Comparably, in life we must look out to the future when welcoming change. The Combs make for both a beautiful site, and a meaningful location to contemplate ones place in the world. After the Combs, we headed towards the funicular to travel up Mount Igueldo. The walk included brief distractions, from sights as mundane as a variety of dogs to those as unusual as a man who, barehanded, caught a squid in the ocean. 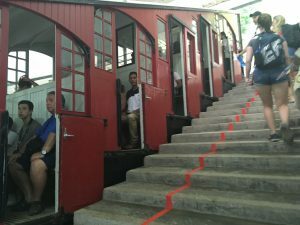 The funicular ride served as a reminder of just how hot the day was, and was a source of fear to those afraid of heights. 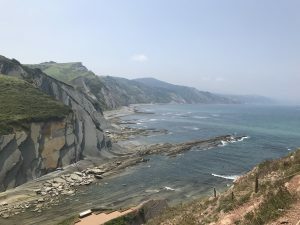 However, once we reached the top of Igueldo we were greeted by a pleasant breeze and gorgeous views of the entire bay; from Mount Urgull to Ondarreta, from Santa Clara Island to La Concha, and everything in between. The breathtaking views were accompanied by the allure of one of the oldest amusement parks in the world, el Parque de Atracciones . Although small, the park boasts simple, man-run attractions that offer some breathtaking view in addition to the thrill. 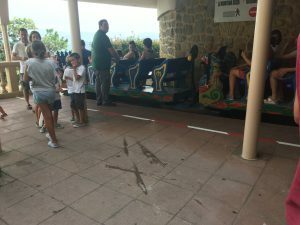 The rollercoaster travels briefly over the sea, right on the edge of the mountain, which allows for a breathtaking view of the ocean. While extremely brief, the ride provides just enough thrill to be exciting. Much like the rollercoaster pushes the edge of the mountain, I hope to continue to push myself to extend my comfort zone while I’m here in San Sebastián. Nowhere else will I be able to walk into any bar, cafe, or supermarket and find freshly made orange juice as well as coffee and alcohol, learn a new language alongside people from around the world, or ride a rollercoaster on top of mountain and be able to sit on the beach in under an hour. 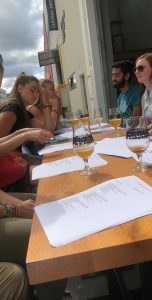 Here in San Sebastián, we are not just studying one culture and one language, we are studying the interaction of people who hail from numerous countries around the world. While our time here may seem as brief as the roller coaster ride, our time in San Sebastián is significantly more thrilling. From beautiful views to cultural experiences, San Sebastián has so much to offer, and I, a first time traveler, have so much to learn. As we walk up Mount Urgull, San Sebastián appears to get smaller and smaller. From the top of the mountain it’s hard to see past the beautiful coast line and antique homes and remember the troubling times of the past. The Basque Country has undergone a lot of conflicts to get to where they are today. They found themselves the victim of the Spanish Civil War after refusing to take sides. Being Basque is different than being Spanish. They did not see this war as anything of their concern. The Spanish Civil War was between the Spanish, and the Basques considered themselves as having little part in those affairs. Basques have a separate culture and a distinct language. And as we read in one of our assigned books, people who move to the Basque region tend not feel completely welcomed even after numerous years of living there because of the close knit community. This was the case with Joni in the novel All That Followed by Gabriel Urza. 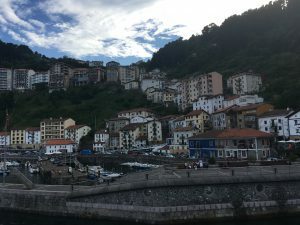 He moved from America to near San Sebastián and despite after living there for twenty years, he still did not feel at home in the Basque region. 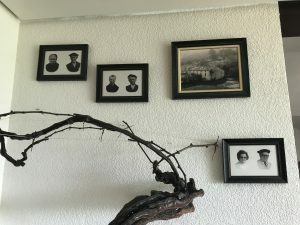 This comes in part from the 19th Century when individuals are only seen and accepted as Basque if they possess eight Basque last names from their ancestors. Since Joni was an outsider and did not possess these last names he was not treated as an important part of the community. Another interesting feature is that around here the friends you have as a child are the friends you have for life. This is known as a cuadrilla. Here, you remain a part of your cuadrilla long after you have grown up and moved far away. Additionally, it is not uncommon to stay with one’s high school or even middle school sweetheart. While many Basques choose to get married, a good amount decide not to get married as it is seen as a religious convention that, especially outside the cities, they hold less and less as part of their identity. The Basque people are thought to be the first ethnic group in Europe. The borders have moved around them, but they’ve remained in this region for thousands of years, which accounts for part of the reason they see themselves as separate from the Spanish, who came later. After refusing to take sides in the Spanish Civil War, the democratic Spanish government offered them greater autonomy if they chose to fight alongside the government for the sake of democracy against the military coup, which was backed by other fascist powers in Europe. Democracy, however, lost, and when General Franco became dictator of Spain, he suppressed the Basque language and culture. Having always seen themselves as independent, they were determined to bring back their way of life and to fight against this cultural oppression. Hence, ETA, the Basque terrorist group, was born. As a result, violence continued throughout this region. A key part of Basque identity and culture is language. The language of Basque is complex and not related to Spanish or another Romance language making it very difficult to learn. In All That Followed, the new English teacher’s wife only spoke English. She was labeled as an outsider and failed to meet new people as a result. After Franco’s rule, the number of Basque speakers started to increase. The division between Basque and Spanish speakers in the Basque region has prompted the use of both languages displayed on road signs and in restaurants. 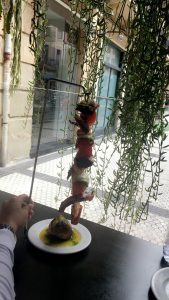 Spanish restaurants and bars have pinchos while Basque restaurants and bars have pinxtos. Pinxtos are never free whereas tapas and pinchos in the Spanish region can be. Pintxo Pote was created after The Recession stole many people’s jobs and left them with no money. Pintxo Pote is one night a week in a neighborhood here where one can buy a pintxo and drink for two euros at participating restaurants and bars. The purpose was to allow for the community to stay close and active with one another because many of them could no longer afford to eat or drink out and socialize with other members of the community as they once had. This weekly tradition was so popular that it has continued long after the aftermath of The Recession. Pinxtos can range from tortilla to prones or chorizo to ham filled croissants. Each restaurant carries a different variety of pinxtos, with the same pintxo from different places never tasting quite the same. Some places are known for their ugly tomato while others are known for their blood sausage. Bread is typically served with each pinxto at all bars, and restaurants and can be seen at any meal throughout the day. Walking back down the mountain it is easy to depict the similarities in each house. San Sebastián has managed to preserve its old cultural roots, Basque language, and house foundation. At 9 in the morning we set out for a winery in Zarautz. 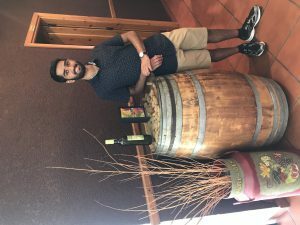 Drinking in the United States versus drinking in Spain is very different, especially amongst younger people. In the United States, binge drinking on occasion is common whereas in Spain people 18 and older drink frequently, sometimes everyday, but they do it in smaller amounts. Over here in Europe the use of alcohol is a lot more laid back. The scenery around the winery was absolutely amazing with a view of the ocean on one side and the vine covered mountain side on the other. The amazing location of the Txakolindegi was completed with a tiny guard dog who came out to bark at everyone as you walked in. Another student learned the hard way that even though most of the dogs here are unleashed, they are not always friendly. Our morning started off with a good laugh after she was chased by the dog. Once the tour started we learned that this was a fifth generation winery. We were able to see, through pictures, the life of the grapes and vines in different stages of the year. Every September the grapes are picked and prepared to be made into wine. After the selection process of the grapes, they are put into machines that get all the juice out of them before being made into wine and eventually stored in one of 16 huge barrels. These barrels store the wine at ten degrees to keep it fresh throughout the year. One by one the barrels are emptied and the wine is bottled. The white wine is the most common for them and the rosè was new (and my personal favorite). 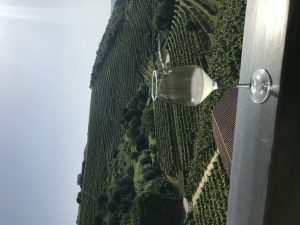 Following the tour we stepped onto a gorgeous terrace with a view of the whole vineyard topped off with a table full of food and wine. After everyone received a glass of the white Txakoli, we had a toast. In that moment I remember thinking about how lucky I was to share such an incredible experience with 10 of my new friends. Even after only being here for a week, Spain has introduced me to new friends and has opened my eyes to many things about the world I didn’t know were out there. Obviously besides eating too much bread and sipping on the delicious wine we had to do a photo shoot. Before setting off for the winery, our professor said the view was too good to pass up for a new profile picture, and he was right. You can’t get much better than what we had. Our chorizo and cheese was washed down with our second kind of wine which was the rosé. I loved the rosé, especially the color. When the constant pictures and go pro videos came to an end, we wrapped up by buying our favorite wine. We stood at the counter trying to do the math to figure out how many bottles of wine we could squeeze into our suitcases without pushing the weight over 50 pounds. On our way to Getaria, we were able to fit in a quick nap after getting stuck in the middle of a bike race. Getaria was a beautiful town where we saw the statue of Juan Sebastian de Elcano. He was technically the first person to circumnavigate the globe because Magellan died in the Philippines before returning home. We stopped for some food and of course I got pinxtos because they’re delicious and then topped it off with some gelato. Getaria is right on the coast and it’s filled with cool looking ships, including a replica of the ship that Magellan and Elcano were on. The streets were filled with restaurants that had outside grills so you can smell the charcoal as you walk by. Our final stop of the day was Zumaia. If you are a Game of Thrones fan, you’re going to be jealous. We hiked deep into the cliffs along the coast to see the breathtaking rock formations. I’ve never seen Game of Thrones before, but apparently this is the spot where some really good scenes were shot because the background is so beautiful. We took a break from our complaining about the hike in sandals and dresses for our second photo shoot of the day. It’s hard to tell which background was the best. It was a lot of great things to see in one day. San Sebastián is gorgeous and so are many of the surrounding towns and cities. The streets are filled with people from all around the world that are dying to get a taste of the world renowned food and a spot on the beach to enjoy La Concha. As I finish my last two weeks here in Spain I’m going to continue to try new things and see everything San Sebastián has to offer with my new friends by my side. When arriving in San Sebastián, all I could think about were the beautiful beaches and the culture we get to be a part of each & every day for 3 weeks. From the excitement our professor showed us, to the positive comments I have heard from students that already went, I was nothing but thrilled and could not stop counting down the days until July 28th. Yes, I was super excited about the beaches, but I also had some nerve in me, because I grew up eating typical American food, from pasta with plain sauce, to hamburgers and chicken fingers. I never really enjoyed “extravagant” meals that had more than four ingredients in them. To me, they just look intimidating. I have always classified myself as a picky eater, but the biggest advice past groups have given me was to try everything you are offered, even if it looks disgusting, and never say no. When I heard this advice, I thought I would not take it, and continue to eat the simplest things I could get on the menu. On a positive note, Julian made us go out of our comfort zone and took us all on a pinxo tour throughout the city of San Sebastián. 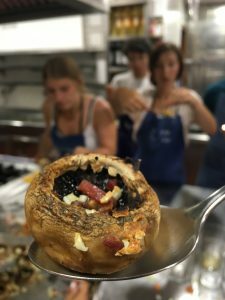 What better way to immerse yourself in the Basque culture then to travel the streets of San Sebastián, stopping at over six restaurants, with five of your classmates and your professor while enjoying a diverse and delicious variation of pintxos. Pintxos, small bite-size culinary jewels are not only an order of food, but they give a new purpose for life and meaning in this incredible town. Our first stop of the tour was a perfect and delicious leeway into the rest, since our first dish was tortilla with potatoes. Tortilla is one of the most famous dishes in this city but is also one of the simplest. They cook the eggs super runny, which we’re not allowed to make because of the FDA in America, and mix it with potatoes, looking like a potato fried pizza. 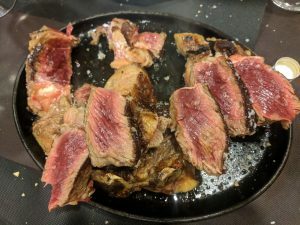 Surprisingly, this is the one dinner dish I HAVE heard of before coming to Spain, since my family has enjoyed it for dinner several times before! After this simple dish, the next two hours were only complicated and diverse tastes. Our next stop consisted of food I have never heard of and tastes I thought I would never acquire. We enjoyed beef cheek wrapped in red pepper, ox tail, and the most diverse of them all, foie gras. Foie Gras is goose liver. When hearing this before I ate it, I was extremely intimidated and nearly refused to try it, but then remembered “never say no”. And what do you know after that? I actually enjoyed this weird food and wanted more. I never thought I would try the cheek of an animal or a liver of a bird walking around the streets, but I did it, and I could not be happier that I did! 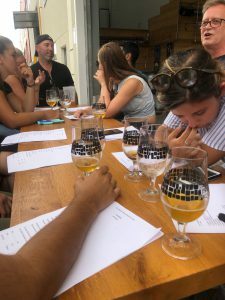 Amongst these two hours of taste testing, not only did we experiment with new foods, but we got the chance to really learn about the culture of Spain and the Basque Country, and the reasons behind the love for food in this amazing city. Unlike America, food is not just a meal that is three times a day at the same time and with the same people in the same places. In San Sebastian, food is how people express themselves, how everyone in the city gets to know each other while creating relationships with servers and bartenders, meeting up with friends on an extended lunch break, how people step out of their comfort zones and create new challenges for themselves that they would not be able to experience anywhere else. One part of the culture that amazed me was that a mess on the floor of a restaurant meant that you are complimenting their food and their restaurant. At first it was weird to me that you could not give a restaurant better reviews than throwing your leftover napkins on the floor, but after experiencing it, I am now amazed. I think it is such a unique culture they have here, and that is one part about Spain I will not forget, because it is different than any other place I have ever been. Another thing that surprised me was their honor system with payment at restaurants/bars. This system proves how sincere and respectful this city is, because the workers trust the diners to pay what they ate without keeping a tab, unlike America. I thought this was so cool and unique because in restaurants in America, we would never trust the diners to pay by the honor system. That is just not how Americans behave because we would take complete advantage of the system. This is why it amazes me that a culture respects each other enough and shows how nice and welcoming this city and country is! Even though we have only been here for less than a week, I will forever be grateful that I took the leap of faith to come to a different country with ten other students who I never met before, because this city has brought us so close together and gives the feeling that we have known each other for a while! We have been lead by the amazing Julian, our own Basque tour guide and teacher. Not only does this place already feel like a second home, but being able to immerse in the culture of the Spanish food makes me grateful for all these experiences and makes me thankful.